We are excited to share the newest resource from Campus Information! The link below will lead you to the new Interactive Campus Map. This will replace any current PDF map located on the Campus Information site. Built on the familiar Google Maps platform, users will be able to easily navigate between campuses, see what buildings contain what departments, get driving or walking directions and even find the nearest appropriate parking lots. 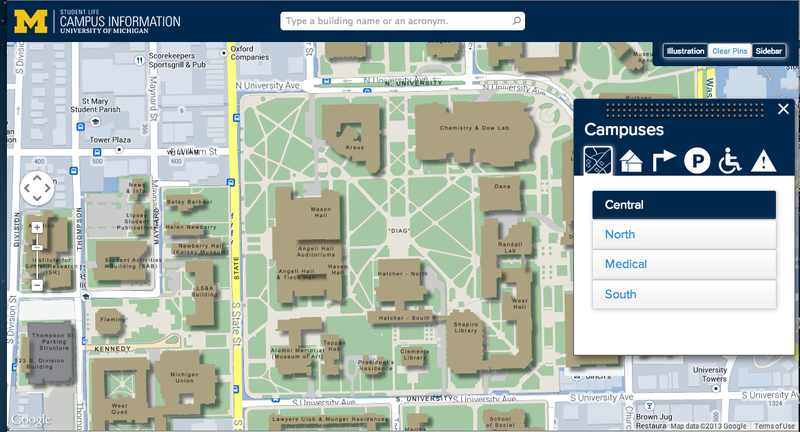 Not only does it have this functionality, it also incorporates U-M building and acronym searching functions. Campus Information has also added additional information such as the location of handicap accessible entrances, and lighted pathways for Central, North and Medical campuses.